To understand the trajectory of demand growth, we turn to econometric models like those published by the EIA and IEA. The central problem with long term supply and demand models is that they require assumptions about the many and interrelated responses to today’s prices. Though modeled responses may be tuned with low precision to relatively recent events and new realities, the actual response curves are poorly constrained and continue to evolve, in some cases at an accelerating pace. As the aphorism goes, all models are wrong, but some are useful. 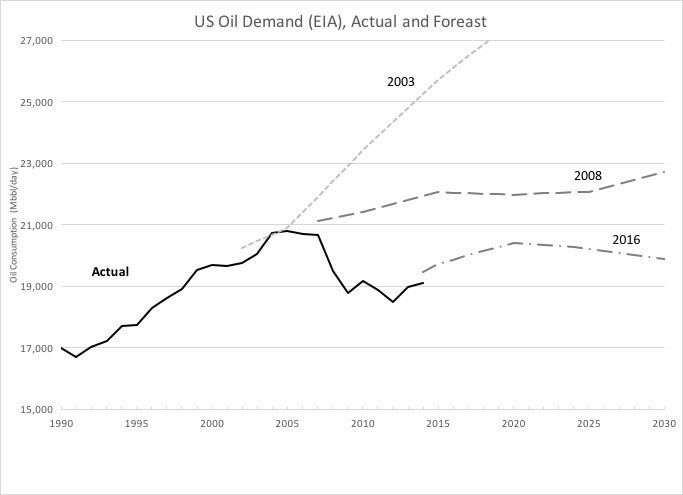 The EIA, IEA and other public econometric models call for global oil demand to continue growing through 2040, and the EIA even calls for renewed growth in the U.S. and OECD demand. The forecasts of growth in global demand rely upon increased use by developing countries, most importantly China and India. On the other hand, the United States has already seen demand decline for about 13 years. In fact it was the second to last of the world’s seven major developed countries to enter demand decline, and the entire OECD group of countries has, as a whole, seen shrinking demand since 2007. 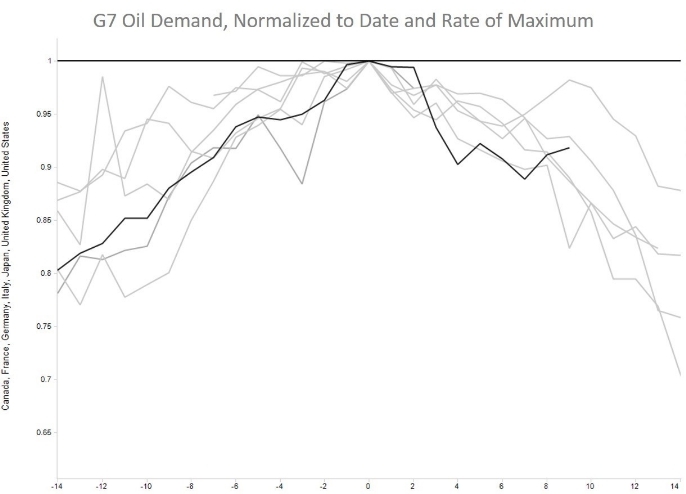 EIA data shows that 35 countries in all have already reached and descended from maximum oil demand. The experience of projected versus actual peak oil demand in the U.S. and OECD countries provides an empirical test and thus context to evaluate the current forecasts of growth and delayed maximum. 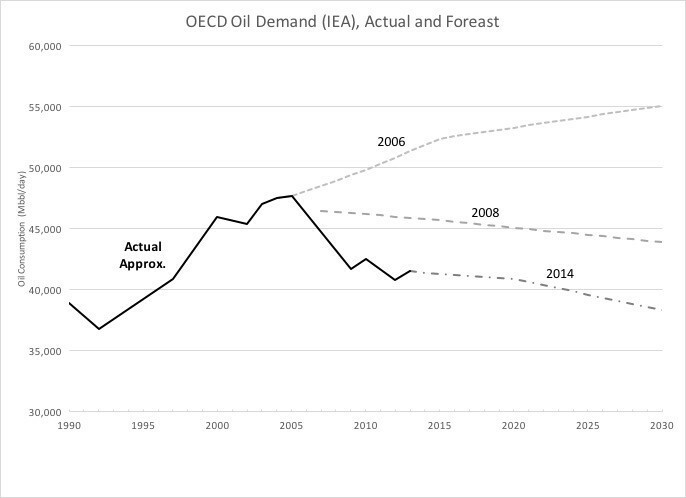 The next chart shows the same kind of comparison for the IEA’s models of OECD oil demand. Actual demand gently achieved its maximum in 2005. Even the alternative policy (lower demand) case in 2006 failed to capture the impending decline, but the reference cases adapted to the reality of declining demand much more quickly than did the EIA. Still the IEA over predicted the actual demand. Though not shown in charts, the EIA’s model of OECD demand growth and the IEA’s model of U.S. demand growth follow the same patterns. In short, these deeply technical and widely used referenced models missed badly the pivot point, the watershed of the object of analysis. For truly exculpatory reasons, the second and third order dynamics of reality were not captured by the models. Dwayne Purvis is a writer for Oilprice.com where this originally appeared.